Blazing hot wins are waiting for you at Vera&John! Blazing hot wins are waiting at Vera&John! It’s never too early to get started on the summer sizzle! And for that reason, Vera&John Casino is offering some fiery wins in a Red-Hot Cash Race! Thanks to Yggdrasil and Vera&John, there are £1500 up for grabs when you play the Incinerator slot! So how does it all work? Easy! Vera&John offer brilliant cash prizes, and anyone could be the winner! All you will have to do is to make real money wagers of £0,20 or more on Incinerator to get your chance on the cash. The prizes will be handed out at random – so pull on your oven mits and get ready to grab some smoking hot wins! There is no limit to the number of cash prizes that you can win – so don’t stop until you see the finish line in this Red-Hot Cash Race! Don’t miss out on your chance to grab a share of the £1500 from Vera&John online casino! 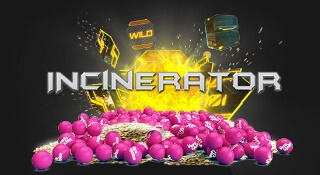 In the Incinerator slot from Yggdrasil Gaming, it is your job to destroy garbage. That might not sound too exciting – but we’re talking about space trash! Travel in space and win with plenty of special features and effects!